We are getting super busy now, coming into San Francisco’s Spring selling season. Are you crazy busy getting ready as well? Is your Spring market busy in your location? Spring is our busiest time of year. Just received a super cool referral from such an unlikely place yesterday. What was crazy about it was not that it was from my SOI. It was from someone in my SOI that I haven’t talked to in over 20 years. 20 years of sending them VMs, emails, hand notes and invitations. And they never responded to any of them. And then, out of the blue, they call me yesterday to tell me they need to sell their Mom’s home. I asked them if they received any of my communications? Of course, they said, they loved them. So make sure you keep emailing, sending hands notes, leaving VMs and inviting everyone in your SOI. I have many of these past clients/acquaintances that never return my calls. But I just keep on keeping on with them. 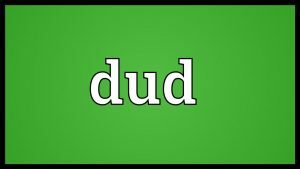 I keep calling the Duds. You never know which of your Duds will turn into gold.